I’m so excited to FINALLY show off my classroom pics (from last year!) 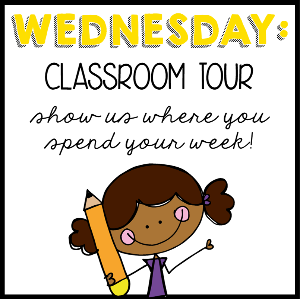 and take you on a Classroom Tour as part of Blog Hoppin‘s Teacher Week! I doubt I can adequately describe my insane excitement when I found out I had been offered a job in a public school in Michigan last year. This is something that I had deemed impossible when I moved to Michigan a year earlier, so even getting a follow up call for an interview was mind blowing. Then when I packed up all of my stuff (with Lily’s help of course – can you see those cute bat dog ears peeking up from the backseat?) and took it to this amazing space (just look at those bookshelves!) I could not wait to get started making this room mine! Think whirlwind of Starbucks, Hobby Lobby, Target, Michaels, on a seemingly endless loop. I didn’t mind all the extra time getting set up. Lily was with me every day and I couldn’t wait to make perfectly covered fabric walls and bookshelf displays that appealed to the eye. I had been dying to retrieve all my Teacher Quote art out of the plastic bins in my basement and set them free to speak to every little 8 year old within the vicinity of my classroom. Hooray! I thought. I will make my room perfect and get ready for another wonderful year! This euphoria seems so comical now as I think back on my 13th year of teaching. Let’s just say that the bathing in sanitizer and imaginary bees I mentioned in Monday’s Fun Fact #2 were just the tip of the iceberg. I was in for a year my husband and I refer to as “Crazy Sauce” the likes of which I’ve never experienced before. Luckily I had amazing colleagues, a fantastic principal who always had just the right thing to say (and sometimes donuts), and a super sweet husband who let me cry and then ordered takeout when I got home. I don’t know what I would have done without them! (and of course my beautiful classroom). Sometimes when everything is Crazy Sauce around you, at least you know you’re sitting in a space you love! Thanks for checking out my classroom! 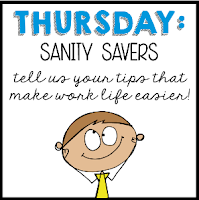 Check back tomorrow for Sanity Savers. So pretty! colorful, and those bookshelves, I am so jealous! I love the rainbow wall!